Look, I meant to kick off my shoe just then. It was totally on purpose. I just didn’t expect you to be jogging by at that exact moment. Do you normally jog with a biking helmet on? I guess maybe now you will. It looks good on you though. Brings out the color in your eyes. This is nothing short of Epic. Shoes make such nice projectiles. I’ve kicked off many a shoe in elementary school. I remember in youth group, we had a contest to see who could kick their shoe the furthest. One almost knocked out a light. Biff has a swing? LUCKY! 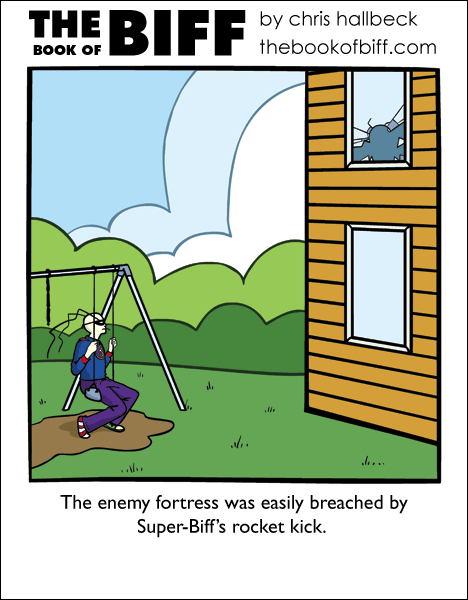 P.S., it’s great to see all of Super-Biff’s awesome powers. Did you know that he saved me from a thousand-armed squid the other day? Whoa… Biff must of gotten pretty mad to dress up and send a shoe flying through…. is that his house? I’ve actually threw my shoe across the room a few times, haven’t done it in years. There’s a risk of breaking something valuable or hitting someone. Wonder how that’ll look on the police report that you hit someone or something with your shoe. Lol. I had a competition with my friend once. My shoe went flying up. . . in the wrong direction. It flew into the parking lot and landed on my teacher’s car. . . while she was in it. Hehe. I noticed the Sausage chain is still there. Long time fan, first time poster. Imagine my surprise seeing Biff appear on Duelling Analogs! Keep up the good work, friend. We once toppled out old school’s super swingset in Alabama. We all had to write the entire rules of the school playground policy 500 times before we were allowed back. Did biff just shoe missle his own house? I’d like to point out that unless the laces weren’t done up all the way on those types of shoes, this Biff is impossible. It takes a lot of unlacing for me to get mine off. @Micah – Dang, an impossible Biff comic. Yeah, I know. I’m sorry. I just had to point that out. I sem to have all of Super-Biff’s powers so far. And a new verb is born: shoe missile! Soon shoe missiling will be an Olympic event! Wish I did. Oh well, I guess that means the neighborhood is safe from my shoe missiles! Heh, that always happens to people playing football at my school. They’re all too lazy to do their shoelaces up properly. In my case, shoe missiles indicate the shoes are clearly too big. We used to do that as kids … there was an 8 foot cedar hedge at the back of our property, and on the other side of that was a bike trail. We’d put one kid up in the tree house to watch for passers-by, and two on the swings with shoelaces undone, ready to unleash footwear-missiles on the unsuspecting. It’s amazing we never hurt anyone.